Having easily accessible water for passengers on the rear deck of an Xtracycle can really improve the riding experience for you and your kiddos. Take a peek at our top 5 ways to mount bottle cages for ease of access by rear passengers. These types of cages come in horizontal mounts or vertical mounts. The clamp is welded to the cage and everything needed to install it is included. Most bike shops will have one or both the horizontal and vertical options available. We have found that cages mounted with Velcro tend to not stay in place as well as cages that clamp on using a clamp with bolts. A horizontal cage will allow you to install the cage on any horizontal bar on the Hooptie. Recommended spots would be: behind the rider’s saddle on the top of the Hooptie bracket (as pictured), inside the rails of the Hooptie, on the rear Hooptie bracket. Installing the cage on the outside of the Hooptie rails could cause the cage to bump into things and move since the rider might forget the added width that the cage will give the bike. Recommended vertical mounting positions would be the vertical bars on the outside or inside of the front and rear Hooptie bracket. 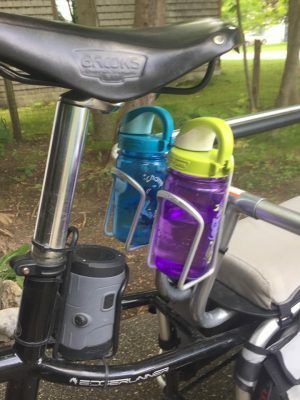 Another option is a water bottle clamp that can be installed on the Hooptie frame and has the welded bosses required for bolting on a regular water bottle cage. Many bike shops have these options available. Clamps are available for horizontal mounting or vertical mounting, and some clamps have both the option to be either horizontal or vertical. 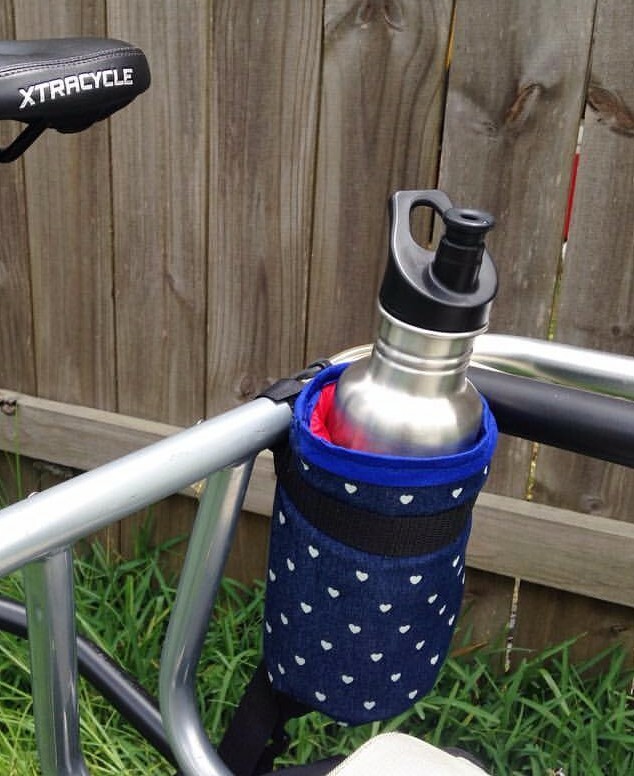 Fabric stem bags can be used for many things, including holding water bottles or snacks. On a regular bike, these are typically installed on the handlebar stem. 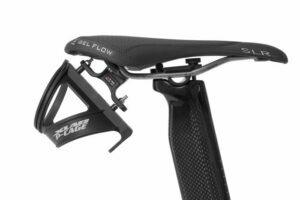 Examples of stem bags that would work on a Hooptie include the Revelate Designs Mountain Feedbag (found here) or the Randi Joe Fabrications Bartender bag (found here). The bag pictured here is a DIY bag made by an Xtracycle team member. The benefit of these bags is that they are very versatile and can be removed from the Hooptie when their use is needed elsewhere, like on another bike. Stuffing a stem bag full of treats and snacks is another way to keep a little rider happy on a long trek. These bottle cages allow for super easy access to water for passengers on the rear deck. Many bike shops have these available. Just be sure that the use of the cage will not be hindered by the front Hooptie bracket. This option will allow you to install a regular water bottle cage using the Hooptie rail welded bosses (the bolts that hold the Hooptie rails to the brackets) and a zip tie. 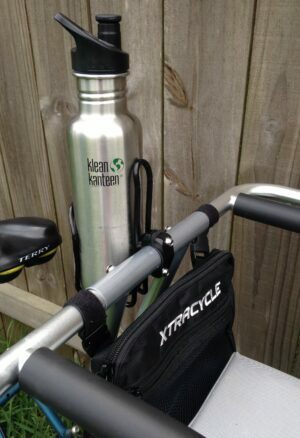 This zip tie goes through the bottle bolt hole on the water bottle cage and attaches to the vertical Hooptie bracket. Shout out to EdgeRunner owner, Nic Anderson, for this awesome recommendation! With these available options, you are sure to find something that will suit your passenger’s needs. Stay hydrated out there and happy biking!